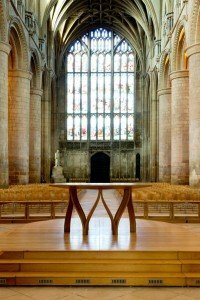 I was recently commissioned to photograph an exquisite collection of bespoke ecclesiastical furniture in Gloucester Cathedral. What commercial photographer wouldn’t be excited at the prospect of a day in a photographically challenging historic building taking photographs of a stunningly crafted suite of quality oak furniture? This commission ticked all the boxes for me and gave me the opportunity to craft a portfolio of images that would work hard for my client. 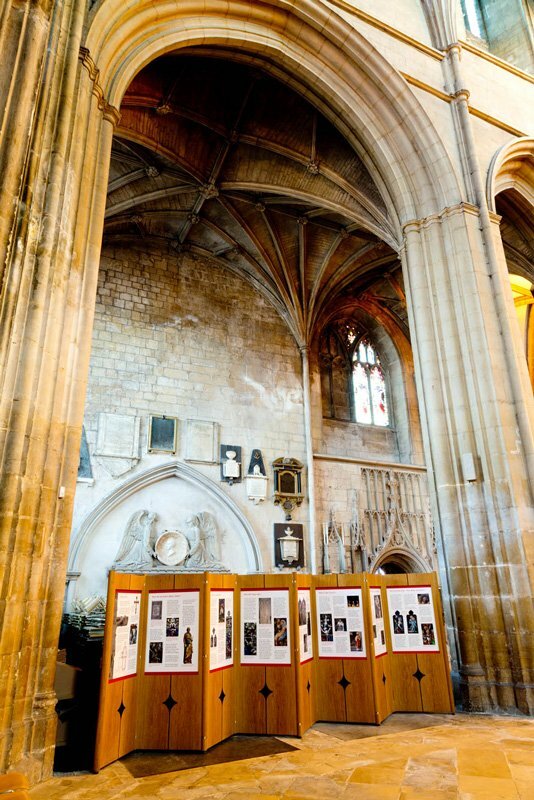 Gloucestershire Cathedral is the oldest in the country and was spared destruction in the reformation due to the fact that many of Henry VIII’s relatives are buried there. Thank goodness for that! Cathedrals and churches are photographically tricky due to the height of the building and the light levels within them. Light casts through the stained glass windows on dull and sunny days presenting a kaleidoscope of coloured patterns all over furniture and floor. My vast knowledge of lighting a shoot enables me to hit the ground running on a project like this and with impressive results. I surveyed the scene and positioned myself to achieve the best angles and perspectives to show the furniture off to best effect. 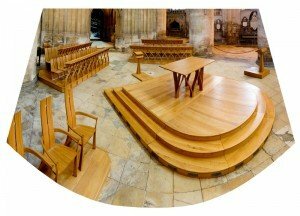 I was very taken with the simple curved lines of the furniture, particularly the table and choir pews. 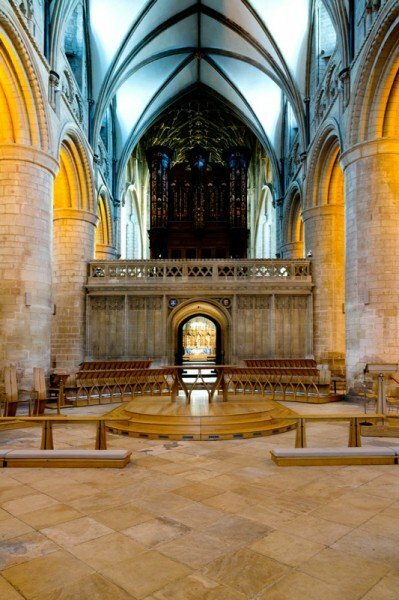 The stately symmetry of the cathedral interior fits perfectly with each piece; I’m presuming a deliberate consideration by the furniture designer. The designer’s interpretation of this space with strong lines and simple motif’s throughout the collection inspired me to perpetuate those themes within my photographs. I’m a creative commercial photographer and as such have worked in creative partnership with many artists and artisans providing images for collateral such as web sites, brochures and advertising. Check out my gallery for an overview of the art works I have photographed over recent years. Working Images for craftsmen and artisans show your work in its best light. Working Images for architectural exterior and interior photography traditional and contemporary buildings are one of my specialities. Please do contact me to discuss your requirements.